A team of scientists led by Dr. Jim Green, Director of NASA’s Planetary Science Division, recently suggested creating an artificial magnetosphere around Mars that could be used to help shield it from solar radiation and wind. Many in the scientific community believe that Mars, like Earth, once had a protective magnetic field that shielded its atmosphere. Around 4.2 billion years ago, however, something happened and the magnetic field went away. It is thought that this event ultimately led to Mars’ atmosphere being lost to space and over the course of the next 500 million years, the planet went from being wet and warm to the cold, baron place we know today. At the Planetary Science Vision 2050 Workshop in a panel titled "A Future Mars Environment for Science and Exploration," Green outlined a plan to a position magnetic dipole shield at the Mars L1 Lagrange Point. This could create an artificial magnetosphere that would encompass the entire planet which would in turn protect it from space. Furthermore, the atmosphere would foster a rise in temperature that would melt the carbon dioxide ice in the northern polar ice cap and hopefully trigger a greenhouse effect, causing additional warming of the atmosphere and melting polar ice caps into water. 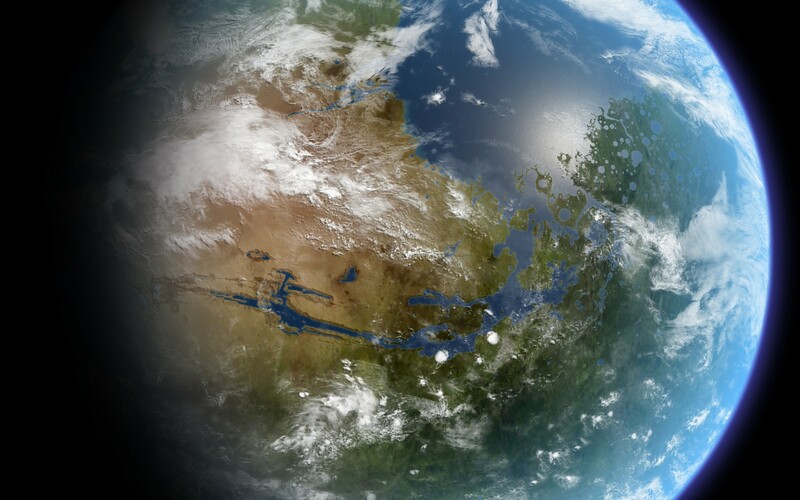 Such a transformation wouldn’t happen overnight but according to Green, a greatly enhanced Martian atmosphere, in both pressure and temperature, that would be enough to allow significant surface liquid water would also have a number of benefits for science and human exploration in the 2040s and beyond. It certainly sounds “safer” than Elon Musk’s idea of nuking Mars.